Delores “Dee” G. Mead, 95, of Sister Bay, died Thursday, November 15, 2018 at the Aurora Nor-Door Clinic. She was born on June 26, 1923 in Clintonville, the daughter of the late Frederick and Martha Geiger. Dee married John M. Mead on September 18, 1945 at the University Chapel in Madison. Dee was very involved with community service her whole life. 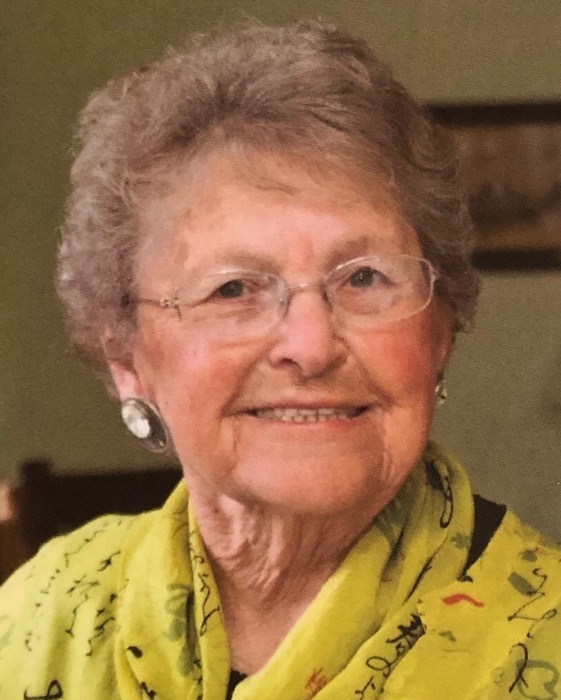 While living in Waukesha, she was a member of the Waukesha Jaycettes, the Garden Club, St. Mary’s Catholic Church and School, and The Women’s Service Club. After Dee and John retired to Door County in 1980, she continued her community service as a member of the Ellison Bay Women’s Club, The Sodality at St. Rosalia’s Catholic Church in Sister Bay, and many hours volunteering at Scandia Village Nursing Home in Sister Bay and their resale store, “Bargains Unlimited”. Dee loved to dance, quilt, play bridge, and was an avid golfer. She was also an artist and painted on canvas, as well as clothing. Dee lived life to the fullest and was blessed with a large family who loved her very much. She is survived by her four daughters, Connie (Greg) Brandt, Nancy Jean (Budd) Carr, Jacalyn (David) Nienow, and Mary Beth (Zack) Mead; two sons, Patrick Mead and Michael (Mary) Mead; 17 grandchildren; and 17 great-grandchildren. She was preceded in death by her parents, Frederick and Martha Geiger; husband, John; eight sisters; and one brother. A Memorial Mass will be celebrated 10:00 a.m. on Tuesday, December 11, 2018 at Stella Maris Parish-Sister Bay. A Mass of Christian Burial will be held on Tuesday, June 25, 2019 at Stella Maris Parish-Sister Bay at 11:00 a.m. Memorials may be given in Dee’s name to Scandia Village Nursing Home. Casperson Funeral Home & Cremation Services, LLC in Sister Bay is assisting the family. Expressions of sympathy may be shared with Dee’s family through her tribute page at www.caspersonfuneralhome.com or sent to the Mead Family at 1455 Sunnyside Lane, Ellison Bay, WI 54210. There's still time to send flowers to the Mass of Christian Burial at the Stella Maris Parish-Sister Bay site at 11:00 AM on June 25, 2019.